System-on-Chip source is hosted on Sergey Khabarov's github page. Link to the documentation in pdf-format. The IP Library is an integrated set of reusable IP cores, designed for system-on-chip (SOC) development. 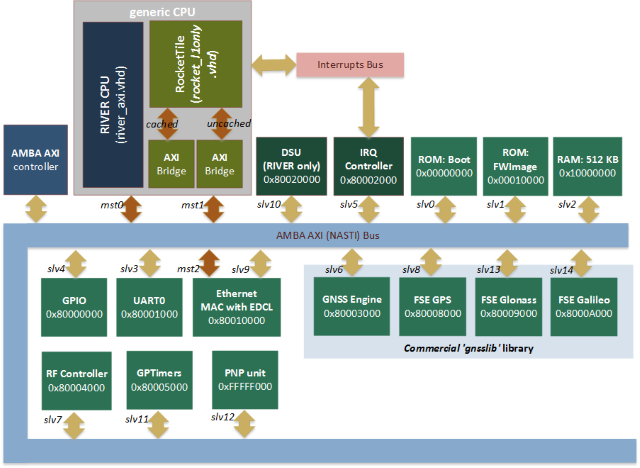 The IP cores are centered around a common on-chip AMBA AXI system bus and BSD licensed "Rocket Chip" implementing open RISC-V ISA. All IP cores use a coherent method for simulation and synthesis. This library is vendor independent, with support for different CAD tools and target technologies. Inherited from gaisler GRLIB library plug&play method was further developed and used to configure and connect the IP cores without the need to modify any global resources. * CPU: Single core "Rocket-chip": 64-bits CPU (RISC-V ISA) with L1/L2 caches, MMU, TLBs, 128-bits data bus and etc. * General set of peripheries: GPIO, LEDs, UART, IRQ controller etc. * Ethernet MAC 10/100Mb (gigabit MAC by request) with the debug function (EDCL) that allows redirect UDP requests directly on system BUS. * Debug Support Unit (DSU) provides access to all processors CSRs. * Satellite navigation modules are distributed as a netlist files (in *.ngc format) or as a stubs.